After a recent crisis in the microfinance sector in Asia, it is slowly rising again and going towards more stringent procedures and supervision by the state, especially in Cambodia, where initiatives to regulate this sector are born. The microfinance sector in Asian countries experienced a difficult crisis in 2010-2011. This crisis, in part due to Microfinance Institutions (MFIs) which have applied too high interest rates, has led many micro-entrepreneurs to debt distress. The microfinance crisis in these countries has allowed the industry to mature to get back on a well base by finding solutions to remedy these evils. However, the cost of microcredit remains high (20% to 27% interest rate per year), many experts agree, however, that this rate is difficult to compress because of the running costs of an MFI for example. In Cambodia, microfinance is framed and supported since 2006 by the State. Access to microcredit in the country remains critical: over 15 million people, only 300,000 have a bank account. Today, 1.2 million people are customers of the 30 MFIs licensed by the National Bank of Phnom Penh and the number continues to increase, the rate of repayment is turning around 98%. The sector is changing fast, with 38% growth in 2012, well above the forecast of experts. Cambodian MFIs like SAMIC (MFIs with which MicroWorld is having a partnership) are the best noted institutions for their information systems, governance and risk control. Hélène Keraudren, Helen Keraudren, coordinator in Cambodia of Entrepreneurs of the World, said on the "Monde.fr" that there is still a risk of "overheating": "The offer is too much, it leads to excessive household debt.". Since May 2011, a law making mandatory for all MFIs to share their customers more detailed data, initiated the establishment of the Credit Bureau of Cambodia in March 2012 by the state to reduce the risk by centralizing client borrowings. 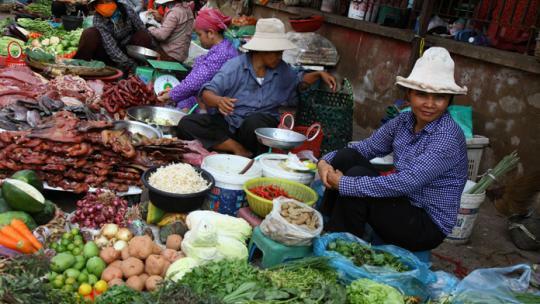 Just as microfinance, social business continues to rise in Cambodia. New businesses such as "Teuk Saat" meaning "clean water" in Khmer use such as solar energy to purify water. This water is five times cheaper than the local market. Today, the microfinance sector is evolving in the right direction in this country. Cambodian Microfinance Institutions are an essential and effective tool to reduce poverty in the country.